Sisters Kathleen Nolan, OP, third from left, and Maurine Barzantni, OP, front row, right, with a group of Co-workers, friends, and Siena Heights University students, take part in the People’s Climate March on April 29. 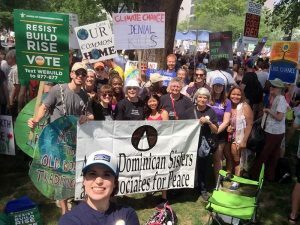 May 5, 2017, Washington, D.C. – A number of Adrian Dominican Sisters, Associates, and friends braved the heat and crowds of Washington, D.C., to express their commitment and concern for Earth and her inhabitants. The group – along with students from Siena Heights University in Adrian – were participating in the People’s Climate March on April 29. The crowd was estimated in the tens of thousands, and some say up to 200,000 people took part in the march, which was organized into eight blocs of activists. The march coincided with the 100th Day in office of President Donald Trump – and of the Feast of St. Catherine of Siena, great Dominican mystic and reformer. 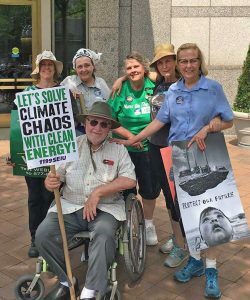 Sister Janet Stankowski, OP, and Patty Gillis, an Adrian Dominican Associate, were among the staff members and supporters of Voices for Earth Justice (VEJ), an interfaith network of people who care for Earth. Their group marched as part of the Defenders of Faith bloc. Patty said she was uplifted to be among the indigenous peoples who took part in the march, and among people of so many faith traditions. “They reminded us all that Care for Creation is a moral and spiritual issue.” She was also pleased to see the influence of Pope Francis on many participants through his picture and quotes from his encyclical, Laudato Si, on banners carried through the streets of Washington, D.C.
Members of the group from Adrian – marching with the Defenders of Truth group – also found the Climate March to be a hopeful experience, in spite of the urgency of the climate change issue and challenges such as the 90-degree heat, crowds, and the difficulty of traveling to the march site. Sister Kathy – along with Sister Maurine Barzantni, OP, and Holly Sammons, Dominican Volunteer – were impressed by the kindness of the people they encountered, whether at their hotel or among other participants, in spite of the discomfort and inconveniences. Sister Maurine saw the interconnectedness of issues represented by many of the marchers, from Black Life Matters activists to indigenous peoples who carried signs such as “Don’t Break Treaties.” But the various agendas “all fit under the same category – respect for our world and respect for the inhabitants of our world,” Sister Maurine said.